People inspect damage at a site hit by what activists said were barrel bombs dropped in Aleppo’s district of al-Sukari on March 7, 2014. Photo: Reuters/Hosam Katan. In an interview on February 8 with BBC’s Middle East editor Jeremy Bowen, Syrian President Bashar al-Assad alluded to indirect and de facto coordination between his government and the Barack Obama Administration in the fight against the Islamic State group (also referred to as ISIS, ISIL, or Daesh). Confident that the United States-led international coalition will continue its air campaign against the group without widening its operations to include his forces, the president appeared triumphant and convinced of his own survival and that of his regime. 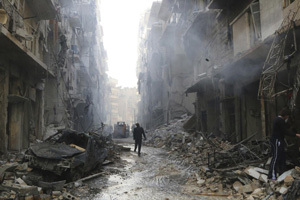 Whether the Syrian President was truthful remains to be seen since his regime thrives on misinformation and propaganda. Yet the possibility that he may at least benefit from the U.S. Administration’s perceived blindness raises serious strategic, tactical, and moral questions about the nature and direction of future developments in Syria. It is undeniable that the Syrian President has used the existence of ISIS and the al-Qaeda-affiliated Nusra Front as justification for his regime’s prosecution of a brutal military crackdown on all opponents. He has used tanks, bombers, helicopter gunships, field artillery, barrel bombs, and chemical weapons in pursuit of a military solution to what was originally and essentially still is a political crisis of profoundly and widely contested rule, and lack of representation and civil liberties. In the aforementioned interview, he even denied that his Russian-supplied flying war machines use barrel bombs against entire neighborhoods in areas outside of his control – that, despite innumerable media and eyewitness reports and raw footage videos available for anyone wishing to document such atrocities. 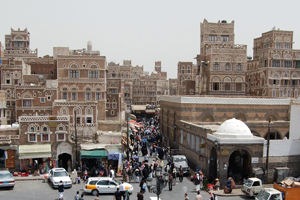 Sanaa, Yemen, is considered by many historians to be one of the oldest continuously-inhabited cities in the world. Photo: Dr. John Duke Anthony. Two weeks ago, the Zaidi Shiite-Houthi march to control the Yemeni state triumphantly arrived at its destination in Sanaa, and forced the resignation of President Abed Rabbo Mansour Hadi and the country’s two-month old government headed by Prime Minister Khaled Bahhah. The withdrawal of the President and Premier was the natural end of an aborted political process that was derailed by a gradual Houthi military advance that brought their militia, Ansar Allah, to the streets of the capital. With the Houthis welcoming both resignations and proposing to form a pliant provisional Presidential Council, the country seems to be heading towards more domestic instability and disunity that will generate regional uncertainties. More importantly, perhaps, the pro-Iranian Houthi triumph in Sanaa is nothing short of a coup d’etat that may, in the end, deliver yet another Arab capital to the Islamic Republic of Iran. In justifying their military putsch, the Houthis accused President Hadi of subverting an all-party agreement at a National Dialogue Conference in 2014 – part of a November 2011 initiative proposed by the Gulf Cooperation Council in answer to widespread pro-reform protests. Participants in the dialogue had agreed to write a new constitution, the draft of which still awaits ratification by popular referendum. The new charter creates a federated Yemeni state composed of six regions to replace the current 22 administrative divisions. The pro-Iranian Houthi triumph in Sanaa is nothing short of a coup d’etat that may, in the end, deliver yet another Arab capital to the Islamic Republic of Iran. Desiring autonomy and eventual independence, the Houthis, who currently comprise about 30 percent of the population, prefer a condominium between a northern and a southern region that many believe would be demarcated along the pre-1990 division of the northern Republic of Yemen and the defunct southern People’s Democratic Republic of Yemen. Such a division would presumably give the Houthis control over the north where their numbers would not be excessively diluted by Sunnis. With the desired division, they could either simply enjoy long-term self-rule or await propitious circumstances to declare independence in a northern rump state that would be a re-incarnation of the old Imamate that died over half a century ago. As for the southern secessionists, whose leader Ali Salem al-Beidh resides in Beirut as a guest in Hezbollah’s southern suburbs, the dissolution of the current union would help them realize a long-held desire to re-establish a state they believe would free them of the oppression of northern politicians. Prince Khaled bin Bandar greets President Barack Obama upon his arrival in Riyadh in March 2014. Photo: Saudi Press Agency. Strategic Saudi Arabian-U.S. cooperation continues. Another prominent Saudi Arabian leader – Chief of Saudi Arabia’s General Intelligence Presidency HRH Prince Khaled bin Bandar bin Abdul-Aziz Al-Saud – visits Washington, DC this week. Coming after recent visits by Saudi Arabian Minister of the Interior, HRH Prince Mohammad bin Nayef bin Abdul-Aziz, and Minister of the Saudi Arabian National Guard, HRH Prince Mit`eb bin Abdullah bin Abdul-Aziz, Prince Khaled’s visit will most likely continue discussions on joint efforts to fight the Islamic State in Iraq and Syria (ISIS). Four months after the formation of the U.S.-led international coalition to degrade and defeat ISIS, Prince Khaled will review past accomplishments, study lessons learned, and coordinate future steps to combat what has become a serious threat to peace and security in the Arab East. Since its June 2014 conquest of northern Iraq with a then-ragtag army, ISIS has become the foremost security and strategic challenge to the nation-state order in the Levant and Arabian Gulf. A now-much-better-equipped and -armed military force occupying large swaths of Syria and Iraq, it possesses a contiguous base of operations that threatens all adjacent countries. The bearer of a messianic vision to re-establish what it considers a virtuous state – a “Caliphate” – that harkens back to the first few decades of the pax Islamica in the Arabian Peninsula more than fourteen centuries ago, ISIS and its close and distant adherents alike sadly represent a hope, albeit false, to disenfranchised, alienated, or simply misguided Sunni Muslims everywhere. A very important Arab leader in the American-Saudi Arabia security and defense relationship arrives to the nation’s capital today. To understand the significance of his visit, and as an aid in how to analyze the implications of visits between world leaders who grapple with internationally relevant issues of security and stability, a word about context and perspective might help. Researchers and analysts examining and assessing the dynamics of defense and security relationships between allies are often guided by several factors. One is an understanding of the prevailing environment. Is it one of peace or war? If it is something resembling neither, does it more nearly approximate a brewing conflict, a fragile ceasefire, or an imminent mobilization and deployment of forces? Is there an anticipated intervention or troop withdrawal, a consideration of placing “boots on the ground,” aircraft in the sky, naval destroyers on the sea, submarines beneath the waves, or some other policy or opinion-shaping matter of concern? Then, recognizing the environment, what is one to make of its possible impact on the parties’ respective needs, interests, and key security, defense, and foreign policy objectives? A second factor can be rooted in the allies’ military-industrial complexes, i.e., the state of relations between their respective aerospace and defense companies. A third can be the dynamics of their bilateral military-to-military relationships. A fourth can consider such matters as arms purchases or transfers. A fifth can relate to military education and training opportunities such as the U.S. International Military Education and Training Program, known as IMET, as it has long applied to Egyptians, Iraqis, Lebanese, various Arab North African countries, and the nationals of each of the six GCC countries. A sixth can sometimes pertain to the prepositioning of security and defense structures, systems, and technologies, together with their maintenance and operations. A seventh can relate to access to and/or use of security or defense facilities. An eighth can focus on the forging, revision, or renewal of a security or military agreement allowing for continuous consultation, joint exercises, and periodic maneuvers. And a ninth can turn on the nature and number of exchanges of visits between and among the allies’ high-level security and/or defense personnel. Visits between and among countries’ most senior security and defense leaders can matter and often do matter greatly. This last-named ninth factor is the one that most pertains to the arrival this evening by Saudi Arabian Minister of Interior HRH Prince Muhammad Bin Nayef Bin Abdalaziz Al Sa’ud and is the focus of the National Council essay that follows. To help one understand the importance of Prince Muhammad’s visit, to appreciate the context and background for why he is coming at this time, and to anticipate and comprehend the issues that he might raise for discussion, the National Council on U.S.-Arab Relations is pleased to learn from Council Distinguished International Affairs Fellow Dr. Imad Kamel Harb. Prince Mohammad bin Nayef receives U.S. Senator John McCain in Riyadh, Saudi Arabia, in December 2013. Photo: Mohammad Bin Nayef Counseling and Care Center. Saudi Arabian Interior Minister, HRH Prince Mohammad bin Nayef bin Abdul-Aziz Aal Saud, comes to the American capital this week to continue consultations on a host of issues of mutual interest to Saudi Arabia and the United States. As Interior Minister with additional responsibly for the kingdom’s policy toward the Syrian crisis, Prince Mohammad is uniquely positioned to coordinate with American officials Saudi Arabia’s efforts against violent extremism, militancy, and the continuing slaughter in Syria. Coming on the heels of the recent visit by Minister of the Saudi Arabian National Guard, HRH Prince Mit`eb bin Abdulla bin Abdul-Aziz, this visit further highlights the important strategic relationship between Riyadh and Washington that serves the interests of peace, security, and stability in the Middle East. An essential element of Prince Mohammad’s visit consists of coordinating respective visions, policies, and plans to challenge the scourge of radical militancy in the Arabian Peninsula and Iraq. Since the September 11, 2001, attacks on the United States, when Prince Mohammad first took charge of the kingdom’s counter-terrorism policy as assistant to his late father, HRH Prince Nayef bin Abdul-Aziz, who himself served as Interior Minister for 37 years, Saudi Arabia has been a linchpin in global efforts to fight terrorist financing, recruiting, and ideology. U.S. Secretary of State John Kerry poses for a photo with GCC and Regional Partners meeting participants in Jeddah, Saudi Arabia in September 2014. Photo: U.S. Department of State. Numerous recent developments point to a positive and fundamental shift in GCC-U.S. relations. From the U.S. heavy re-engagement in Middle Eastern issues, to the success of the fourth ministerial GCC-U.S. Strategic Dialogue Forum in New York last September, to fighting ISIS, to continuing consultations about Syria, Iraq, Iran and others, it appears that the strategic partnership is being re-established on a different basis than before. This is despite the perpetuation of various disagreements and misunderstandings. Such renewal is bound to have an important impact on the future of bilateral U.S.-GCC relations and many other related issues, especially their joint and respective efforts to effect positive change in the region. The current state of affairs between the United States and the GCC countries – Bahrain, Kuwait, Oman, Qatar, Saudi Arabia, and the United Arab Emirates – is a far cry from public comments by Arabian Gulf officials a few months ago. These intimated what some considered irreparable damage to established strategic relations. GCC governments showed grave concern about America’s intention to re-balance to the Asia-Pacific theatre, its attempts to re-habilitate Iran and bring it in from the cold, its abandonment of Iraq to violent extremism and the Islamic Republic, and arguably, its vacillation regarding Syria and its grinding civil war.1 From its part, the United States showed signs of fatigue from its long and costly commitments in Iraq and Afghanistan and produced debatable decisions relating to one of the world’s most strategically vital regions. In reality, America’s change of policy was the start of a “re-balancing of the ‘re-balance’” back to the Middle East, while, fortuitously, the GCC and other countries saw it as the right decision at the right time for the world’s leading superpower. But, given Washington’s many trepidations about being once again enmeshed in trouble in the Middle East, the American about-face could not be sustained without the effectiveness of willing and capable regional allies. In reality, America’s change of policy was the start of a “re-balancing of the ‘re-balance’” back to the Middle East,3 while, fortuitously, the GCC and other countries saw it as the right decision at the right time for the world’s leading superpower. The United States has obviously re-engaged in the Middle East for the long-term. Equally clear, the GCC states have committed to a broader and more assertive role in the region. 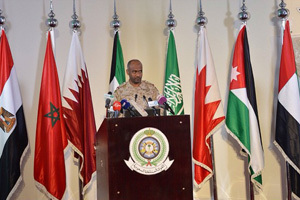 As geo-political and geo-strategic realities and conditions develop over the next weeks and months, it will likely become increasingly evident that a strengthened U.S.-GCC relationship is the only practical and prudent alternative for the United States, the GCC countries, and the world at large to help attain and maintain a semblance of sustained stability in the Middle East. An important and thus far little discussed component among these developments in U.S. as well as GCC policy and behavior is a renewal and reformulation of an alignment with Egypt that was shaken over the last few years. A successful realignment of the ties between Washington and Cairo, coupled with strategic linkages between Egypt and key GCC member-countries, will doubtlessly do much to cement the overall GCC-U.S. relationship.